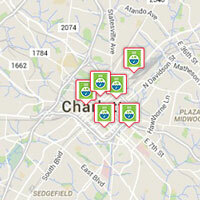 Locker Revolution is introducing a new way to dry clean and launder in Charlotte. We’re placing Locker Revolution lockers in residences, offices, gyms, and other convenient locations where Charlotteans can dry clean on their schedule, 24 hours a day, 7 days a week. I created my account via text. How do I login online? If you created your account via text, use the CHANGE/FORGOT PASSWORD link on the login page and follow the instructions sent to your email. What are the Locker Revolution bags for? Your first order will be returned in a protective garment bag barcoded with your information. Please keep this and reuse to drop off future orders. Simply save a credit card in your online account profile and it will be securely charged on all future orders. We also email you an itemized receipt with every order so there are no surprises. You must have a credit card on file in order for your order pick-up information to be released. How do I tell you my cleaning preferences or special instructions? You can input your starch, detergent, and other preferences in your online account profile, and we’ll save them for all future orders. You may also use the notecards and stickers on the shelf nearby the boxes to mark stains, indicate missing buttons or write special instructions. Where do my clothes get cleaned? Our cleaning facility is run by a second generation dry cleaning and wash & fold artist, whose family has been a pinnacle of Charlotte dry cleaning for decades. What happens if I’m out of town and I leave my laundry in a box for a week? Not to worry! We’ll send you a reminder or make special arrangements if there is an issue. Contact us anytime at info@lockerrevolution.com or 704-919-1580. Get text and pick up clothes. Find a locker near you. Download the Locker Revolution app.